The last PPC campaign I analysed in the ‘Analyse A Real PPC Campaign’ series was from Formula 1, who had a very well designed search advert that made use of the fact it was the ‘official’ Formula 1 company, using trademark and copyright symbols where appropriate. However, the landing page was one of the worst landing pages that was analysed in this series, with many reasons to why it was such a bad landing page. One market that is sought after is the wallet industry, since it is something everyone needs and want nice versions of. For this reason, here is an analysis of a PPC campaign from bellroy. What is interesting about this is the fact that bellroy’s advert is the only search advert displaying for such a critical keyword search phrase for the market. 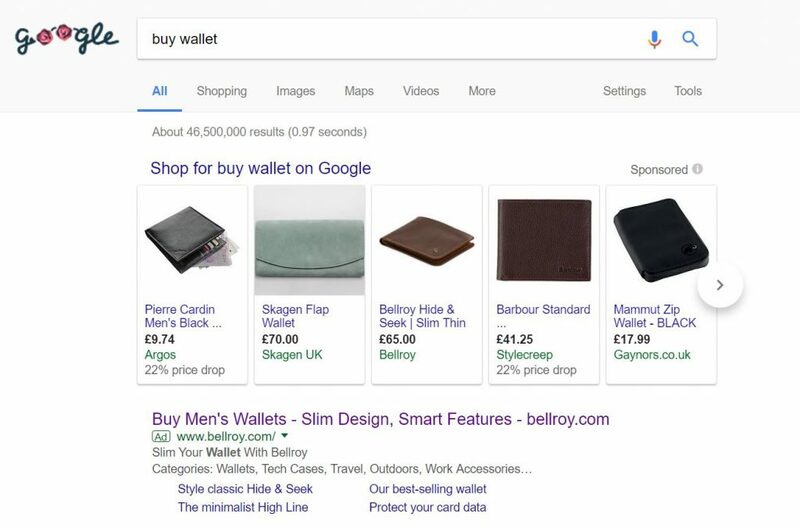 This is partly down to the fact that there are sponsored shopping results that enable the wallets to be shown as well as their prices – with this, bellroy have one of their wallets in this section too, helping bellroy to dominate the paid search results area. Why did bellroy make this advert? They do not appear on the first page for this search phrase which, for a website which predominantly sells wallets, is not ideal. PPC enables bellroy to recover from their poor SEO. The search advert itself is well designed. The domain name is included at the end of the title with a call to action at the start and an enticement in the middle. As well as this, the site link ad extension is used to enable the web user to click onto specific types of wallets (and also increase the area of the advert on search results). 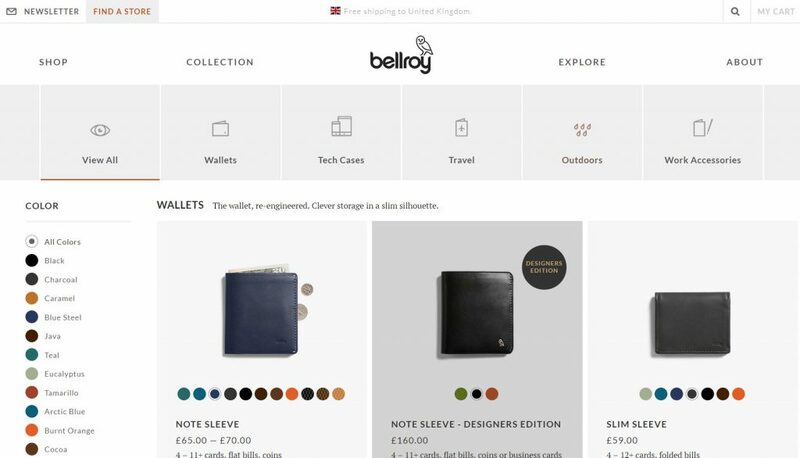 The main navigation menu is large and clear, allowing the web user to explore the other products bellroy sell. The main central attraction of the landing page consist of images which show off the wallets, with the ability to change the colour of each wallet at the click of a button – a very nice feature to have. From also showing the wallets with a little bit of the box below the fold will inherently encourage the web user to scroll down to view even more walletd bellroy have to sell. On the left hand side is a filter, which is an extremely effective element to any website selling something with different features. It allows the web user to narrow their search down in an easy manner. Although the wallets themselves are quite expensive, the fact that they are all leather and can be many different types of leather adds a real sense of quality to this brand name. This concurs with the PPC search advert, which mentioned that the wallets were ‘slim’ and had ‘smart features’. Therefore, on the whole, this a very good PPC campaign. Why Do Advertisers Choose PPC?